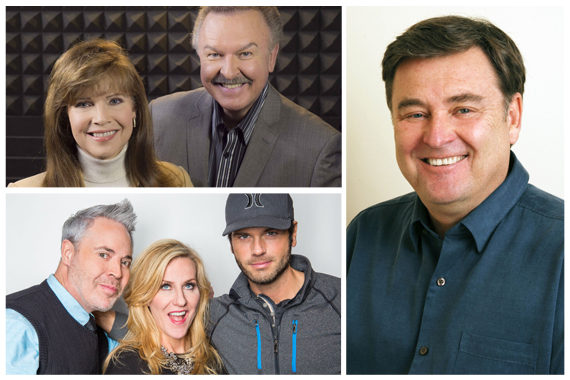 Pictured (clockwise from top left): Lorianne Crook and Charlie Chase; Lon Helton; Blair Garner, Kelly Ford, and Chuck Wicks. The Country Music Association revealed the finalists for its Broadcast Awards on Wednesday morning (Aug. 31). Cam, who is a first-time CMA Award nominee this year with nods in the Song of the Year and Music Video of the Year categories (both for “Burning House”) notified the CMA Broadcast Awards finalists for Personality and Radio Station of the Year with personalized video messages. In the Broadcast Personality of the Year category (National), Cumulus’ America’s Morning Show (Blair Garner, Kelly Ford, and Chuck Wicks) was nominated as well as Westwood One’s Country Countdown USA (Lon Helton), and iHeartMedia’s The Crook and Chase Countdown (Lorianne Crook and Charlie Chase). Major Market finalists include KKBQ – Houston-Galveston, Texas, KWJJ – Portland, Oregon, WKLB – Boston, WMZQ – Washington, D.C., and WSOC – Charlotte-Gastonia, North Carolina/Rock Hill, South Carolina. The winners will be notified in mid-October and will be acknowledged at The 50th Annual CMA Awards to be held Wednesday, Nov. 2 (8:00-11:00 PM/ET) and broadcast live by the ABC Television Network from the Bridgestone Arena in Nashville. Brad Paisley and Carrie Underwood return to host. The categories are established by market size based on population as ranked by Arbitron. Entries for Broadcast Personality of the Year are judged on aircheck, ratings, community involvement, and biographical information. Candidates for Station of the Year are judged on aircheck, ratings history, community involvement, and format leadership. CMA members who are full-time, on-air personalities, and CMA member radio stations in the United States and Canada were eligible to enter. The entries are judged by a panel of distinguished broadcast professionals, representing all market sizes and regions. “Chris Carr & Company” (Chris Carr, Jeff “Maverick” Bolen, and Kia Becht) – KEEY, Minneapolis-St. Paul, Minn.
“Dave and Veronica Morning Show” (the late Dave McKay and Veronica Alfaro) – WQYK, Tampa-St. Petersburg-Clearwater, Fla.
“The Michael J Show” (Michael J. Stuehler) – WPOC, Baltimore, Md. “Tanner in the Morning” (“Rob Tanner” Lamb, Willa Hamrick “Catherine Lane”, and “Chris Allen” Gordon) – WSOC, Charlotte-Gastonia, N.C./Rock Hill, S.C.
“AJ & Ashley In The Morning” (AJ Maguire and Ashley Stegbauer) – WWKA, Orlando, Fla.
Brent Michaels – KUZZ, Bakersfield, Calif.
“The Gator & StyckMan Program” (Gator Harrison, Greg “StyckMan” Owens, and “Cowboy” Kyle Croft) – WUSY, Chattanooga, Tenn.
“Ken, Kelley, and Daniel” (Ken Hicks, Kelley Bradshaw, and Daniel Wyatt) – WUSY, Chattanooga, Tenn.
“Maverick and Lulu in the Morning” (Maverick Johnson and Luanne “Lulu” Krysz) – WCTQ, Sarasota-Bradenton, Fla.
“Tom and Becky” (Tom Owens and Becky Palmer) – WBBS, Syracuse, N.Y.
“Afternoons with Cash” (Cash Williams) – KTTS, Springfield, Mo. “Barrett, Fox & Berry” (Bill Barrett, Tim Fox, and Tracy Berry) – KKNU, Eugene-Springfield, Ore.
“Ben and Arnie” (Arnie Andrews and Ben Butler) – WCOW, La Crosse, Wis.
“The Eddie Foxx Show” (Eddie Foxx and Sharon Green) – WKSF, Asheville, N.C.
“Scotty & Cara in the Morning” (Scotty Cox and Cara Denis) – KCLR, Columbia, Mo. WSOC – Charlotte-Gastonia, N.C./Rock Hill, S.C.
WYRK – Buffalo-Niagara Falls, N.Y.
WCOW – La Crosse, Wis.